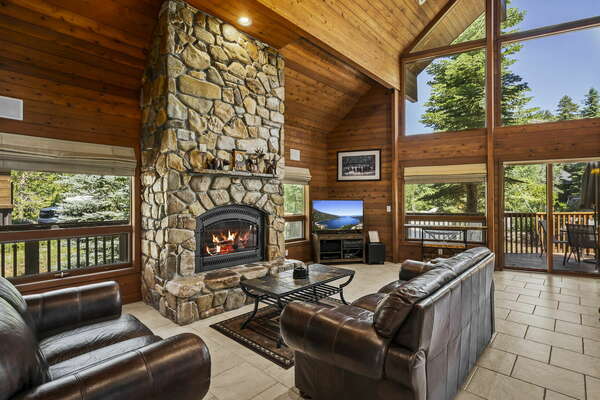 This glorious Tahoe Donner Upscale Mountain Escape was built in 2014 and it’s a beautiful 4 bedrooms, 3 baths home with a reversed floor plan and within walking distance to Trout Creek Rec Center. As you enter the house you’ll be welcomed by an open floor plan, high vaulted ceilings and large windows for natural light. The seating area will gather everyone around the fireplace, TV or a game night with family. On the same level you’ll find the master suite and the guest bedroom with a full shared bath. The floor below opens up to a beautiful family room, the other 2 bedrooms and a full bath. Either you’d like to join everyone upstairs or read a book on the deck, or watch a movie in the family room, there is plenty or space for everyone to spread out. Our Tahoe Donner Upscale Mountain Escape is a great property to spend your summer as well as your winter vacations, the association gives you access to the clubhouse that has 2 swimming pools (a heated lap pool open year round and a big pool open in summer only), 3 hot tubs, 2 saunas, a cardio and a weight room. There is also a golf course and tennis courts only a few minutes’ drive from the house as well as a private association beach on the east end of Donner Lake. Tahoe Donner has a ski resort as well that’s available for your enjoyment, especially great if you have children. You won't even need to leave the area because of all the great activities offered including 2 restaurants, hiking, and biking trails just as you walk out your front door, enjoy our private vacation home as much as we do. Each eligible property is issued two guest cards to access the recreation fee amenities available in Tahoe Donner. Guest cards only allow for up to 4 guests per card. Guests are anyone seeking access to amenities over the age of 7. Guest access fees are currently $15 per person per day. Children under 7 are free.